At 8000 feet above sea level, the world seems different. The air is cleaner, the atmosphere, more rejuvenating, and if you are a city dweller, you'll find yourself in a place so slow paced, you'll want to breathe in every bit of the experience. Rishyap can be reached via a short 4-kilometre trek from Lava in the north of West Bengal and the trip there is worth the experience that follows. Rishyap translates to mountain peak and a tree. It is situated amid some beautiful hidden hills at the Neora Valley. It offers an excellent view of Kanchenjunga, and other famous peaks to visit and photograph are Talung, Pandim, Simvo and Kharg. The Lava Monastery is also within walking distance of Rishyap. For a glimpse of some dense pine forests, head towards Pedong, which is approximately 20 kilometres from Rishyap. This region also connects India to Tibet. Tifandara is another place of interest, which is also known as Sherpa Dara, from where a view of the snow-capped Himalayas can be seen. 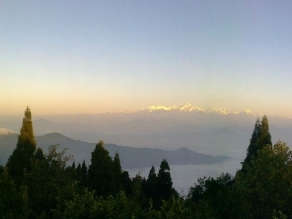 Rishyap is one of the only places from where views of both Nepal and Tibet can be caught. Nature walks are common in Rishyap and one must definitely try a guided tour of the place. The closest airport to Rishyap is Siliguri. Tourists are advised to make travel arrangements beforehand and carry essential medicines since they aren’t easy to come by at Rishyap. The climate of Rishyap is pleasant. The best time to visit Rishyap is right after the winters, when the temperature is not extreme and becomes ideal for travelling. Rishyap is well connected by road and rail. Rishyap can be accessed by road via National Highway 31A from Siliguri and is a 94 kilometers from the city. The nearest rail head from Rishyap is Siliguri and is well connected to the rest of the state. The closest airport to Rishyap is Bagdogra with connections to major Indian cities. It also connects to some International destinations.